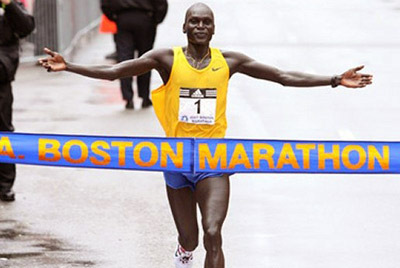 The Boston Marathon is an annual marathon held in Boston, Massachusetts on Patriot's Day, the third Monday of April. The Boston Marathon is an annual marathon held in Boston, Massachusetts on Patriot's Day, the third Monday of April. The first ever race was run in 1897, inspired by the entrance of the event into the 1896 Summer Olympics, making it the world's oldest annual marathon. Today it is one of five World Marathon Majors (the others being Berlin, London, Chicago, and New York City). The course stretches the traditional 26 miles from the starting point in Hopkinton, Massachusetts, through winding roads and city streets into the heart of Boston, to Copley Square, where the official finish line is located, by the Boston Public Library. Runners will take advantage of features, such as the significant downhill trend and tailwind, while they face challenges like the Newton hills, the most famous of which being Heartbreak Hill in the latter part of the marathon, near Boston College. The marathon has evolved to be one of the many draws of this fascinating city. Attracting over half a million spectators a year and more than 20,000 participants of all ages and walks of life, it is one of the biggest events in the calendar. It is the only marathon outside of the Olympics that require athletes to qualify. Many people participate to raise money for different causes and charities, while others look to set a new personal best while braving the varied Boston climate. If you're coming to watch the race and cheer somebody on, then be sure to book one of the many Boston hotels in advance! Over the years many traditions have developed, one of the oldest of which was started in 1903. Every year the popular baseball team the Boston Red Sox plays a home game at Fenway Park. At the end of the game, the crowd heads out of the stadium into Kenmore Park to cheer on the athletes, as they begin the last mile of the event. A historical event in a historic city, the Boston Marathon is an ideal opportunity to explore "The Cradle of Liberty" and the diverse range of Boston attractions. Why not take the easy route, with the Boston CityPASS or the Go Boston Card? Visit famous universities such as Harvard and Massachusetts Institute of Technology, or take the Freedom Trail tour during a wonderful visit to the spectacular city of Boston.